We’ll send both curved end pieces and straight end pieces for your choice. 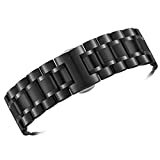 Band width: 23mm Buckle width: 23mm Thickness: 3.5mm The maximum length is 178mm(7inch) and it comes with 6 removable links to adjust the length to suit your wrist size. Savour the style and precision of our beautifully crafted high-quality metal watch straps. Our watch straps are made from high end selected 316 marine grade stainless steel, for greater resistance to corrosion and nickel allergies. We also use the best PVD coating technology to ensure the long lasting of the color. Crafted with stainless steel on specialized German machines, the strap is strong and durable, as well as flexible for comfortable wear. Professionally made and attention to detail has been made to the level of finish to the machined links. All transition line angles are finally rounded and polished carefully at low speed. It’s specially designed and made for your luxury watches. It can be applied to watches with standard straight lug ends, such as Tissot, Longines, Wenger, IWC, Rolex, Mido, Omega, Cartier, Tudor, Movado, Rado, Hamilton, Titoni, Certina, Swiss Military, MontBlanc, Armani, Jaeger, Invicta, Zenith, Orgival, Ranceas, Timex, etc.. It comes with a deployment clasp with double push button to give you quick release and removal of the band. The watch wristband is nicely packed with a free set of matching spring bars included.